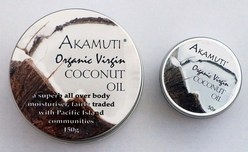 Akamuti Coconut Oil - organic, virgin and fairtrade. We sell organic, fairtrade coconut oil. We include it in our new mum and new baby hampers and we love it! It's eco-friendly, great for sensitive skin and smells lovely. Chicken pox - the oil melts easily on your hands so even my most stubborn of 3 year olds barely noticed me putting it on. I also put some in the bath water and it definitely prevented their skin drying out. No itchy little ones for us. Hair - it makes a fantastic, intense hair conditioner. I have only done this once but my hair the next day felt like it had been tucking into superfood. And we heard on Twitter today from @WBMonkeyMonkey "I used to use it in my hair on a monthly basis as so dry from hair dye!" It really does give your hair a treat. Hands - with nappies and new babies and keen toddler cooks etc I am careful to wash my hands and have to do it quite often. I use the coconut oil on my hands after washing and even this horrible weather hasn't meant dry hands for me. New baby skin - because it melts so easily, you just have to gently run your hands over that tiny (slightly scaly!) body and the oil absorbs straight in. My baby was born one week late and that means her skin was quite dry. But it settled down in no time with a bit of oil. Give it a go. Highly recommended! Akamuti virgin fairtrade coconut oil available here at Really Eco baby.